by high quality fuzz units and classic tube amps: rich harmonic content, complex textures and amazing dynamics, closely interacting with the playing. 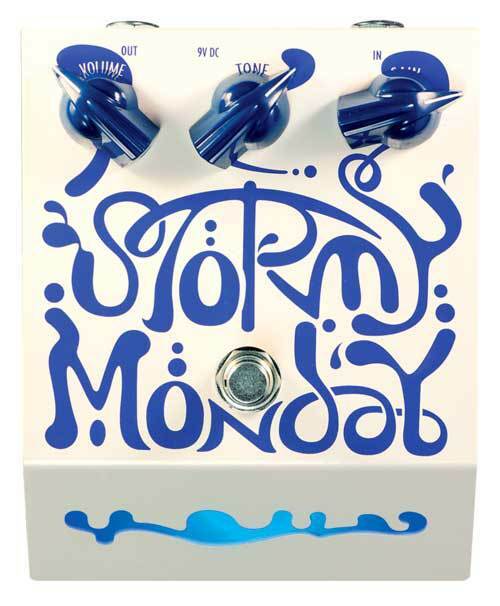 Do not expect the Stormy Monday to sound boxy, with limited frequency response and with flat response to pick attack or different instruments. It's alive! pressure and velvety when played softly. unit, we prefer a broad frequency spectrum, with enough bass and treble content, not only a mid heavy thing. On the other hand, to use it as a booster, it’s undeniable that the mid focused tone is an amazing tool. So we incorporated that in the Gain control: when used above halfway, you have solid bass to beef up your drive; but when set below half, bass and treble are attenuated and the overall tone is focused on the midrange. Best of both worlds! Try using that setting after a pedal with depleted midrange and you’ll see what a powerful filter you have there.